Looking for something to do this weekend? Head to Torrita di Siena for some donkey races! Torrita di Siena is a small medieval hamlet to the southeast of Siena, not far from Montepulciano. Since 1966, the town has organized the competition between the town’s neighborhoods, very similar to how the Palio in Siena and many other competitions in Tuscany are organized with various sections of the town competing against each other. The festivities around this festival, “Palio dei Somari”, have been taking place all week, with the drawing of which “contradas” will race already taking place last weekend. 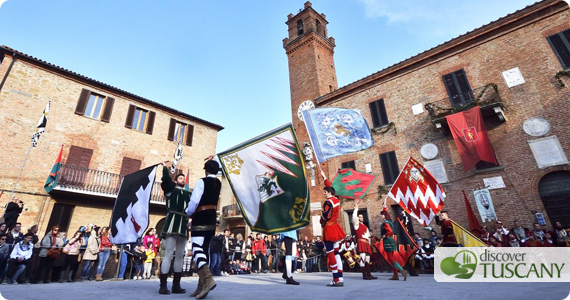 This Saturday, March 23, the medieval banquet starts at 6pm and at 10pm there is a competition between drummers and flag throwers but the main event, the Palio, takes place on Sunday March 24 at 4pm. The historical parade and other exhibitions take place in the morning from 10:30am so you should make a day out of it!